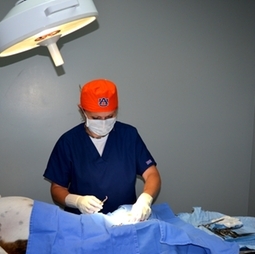 Here at Murray Animal Hospital we offer a variety of surgeries including routine spays and neuters. We do offer several different surgical procedures and have a referral service for any procedure we are unable to perform. We offer pre-op procedures like Pre-Anesthetic bloodwork, IV Catheter placement, and EKG's to monitor any heart problems. Surgery may be routine but anesthesia is never routine; therefore, we have a liscenced technologist monitoring your pet during his/her surgery. We take every precaution to make the surgeries as safe as possible for your furry family member.